Hellhammer and Celtic Frost have undoubtedly influenced several generations of extreme metal artists, in terms of their oppressive, heavy riffing and morbid lyrical concepts; but one component you more rarely hear emulated is the vocal style of Tom G. Warrior. Sure, Monotheist and Triptykon form the natural extension of that, but as one who isn't partial so much to that last act's songwriting and riff construction, I'm glad to find other venues. The foremost would be Nocturno Culto of Darkthrone who puts his own spin on the style (especially in the collaboration outfit Sarke), but there's another down under who have been kicking out such leering jams for about eight years, and that is Australia's Ruins, project of Alex Pope and Psycroptic skin punisher David Haley. Place of No Pity is the duo's fourth full-length effort, and one of their best to date. 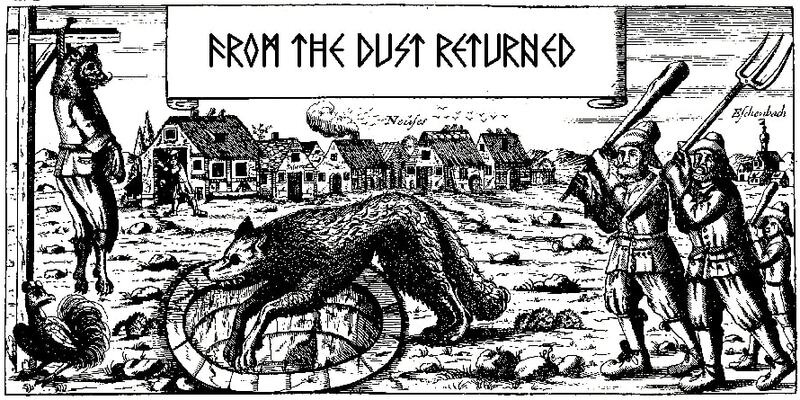 Think if Warrior's throaty, tortured and crumbling vocals were placed in a Scandinavian black metal milieu circa the mid 90s and you'll draw a pretty good sonic picture of this album. The chord textures are just as often harmonic as they are dissonant, and there's a good deal of variation between tracks which helps pad out the potentially oppressive 60 minute duration. The riffing isn't the most complex available to the black metal fan, and a lot of the groovier songs (like the 9 1/2 minute title track) definitely summon up comparisons to acts like Khold, or the last few Satyricon records, but by no means is Ruins limiting itself to just these sorts of tempos. You'll find Haley unleashed on plenty of blast beats throughout, and the burlier tracks feature enough contrast between slower and faster material that one won't quickly become exhausted by the ceaseless repetition which has plagued a lot of black metal records these past 20 years. The leads fulfill a number of good melodies, and the band's pretty flexible between the more open, atmospheric chord-driven progressions to some tightened, thrash-based riffing; Dave's brother Joe is playing alongside Pope here, and the two are definitely a solid pairing capable of texture and dynamic range. 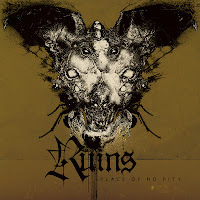 Place of No Pity is hardly some paragon of lo fidelity grimness, preferring instead to work with a brazen, professional sounding production that allows the chords to shine and the depth of each instrument to stand against the others. For instance, the bass here, while not intensely deviant from the rhythm guitar patterns, has a pretty distinct presence beneath the brighter, thinner tone of the chords. The drums are intensely level and never smothered by the riffing, and the vocals perfectly placed so that they only vaguely dominate the mix. This is not an album sounding as if it were recorded on a 4-track behind a dilapidated garage, so there's always a chance it might turn off some of the purists seeking that sort of sound; but anyone into the higher budget Norse, Swedish or Finnish black metal of the past 15 years will probably dig that the band qualifies such sleek recording standards. 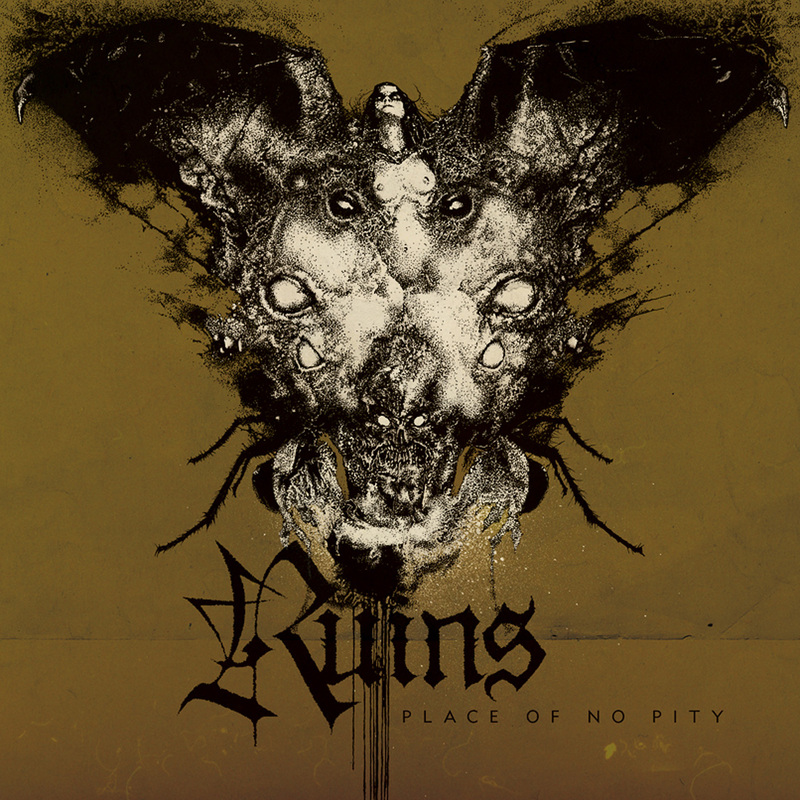 Ruins is hardly composing the most immortal riffs out there, but this is nearly in league with 2009's Front the Final Foes, a fine album itself, and I personally enjoy how they confirm speculations of what a Frost-like sound can evolve into, without the excessively raspy or hoarse guttural vocals you generally expect in extreme metal. A good band deserving more attention than they've yet received.